I am a huge, huge fan of all things Award show. If it's an award show day, you can almost guarantee that I will be sitting on my couch from about 4:00 pm - 10:00 pm (or whenever they end) as I soak up every minute from the red carpet extravaganza to the last award of the night. I don't know what it is about the award shows, whether it's the fashion and the glam, or the excitement of the stars being recognized - regardless, I can't get enough. So when my husband called me awhile back telling me he was given an invitation from his boss to attend a Black-tie Oscar Experience Gala, I nearly jumped up and down and quickly responded "Are you serious?!" Needless to say, we were definitely on board and super excited for whatever encompassed this fabulous event. Checking out a few fashion sites, dreaming up my red carpet look, my afternoon consisted of getting glammed up. My dress was a great find at a BCBG outlet- a black, one-shouldered fit and flare (fitted throughout my bodice and then flared out a bit mid-thigh). I loved it. And my shoes were a strappy dark gray 4" Calvin Klein heel. I decided to go with a sleeked back pony with a bit of volume (thanks to a sweet friend willing to brainstorm with me), smokey eyes, and a red lip. I'm all about a red lip- and thanks to the good ole folks at Sephora, I found a great go-to red lipstick that I think would look great on just about anyone. Check out Nars- Red Lizard if you're in need of a great red. Once all glammed up we headed downtown Milwaukee for the event. But before I describe the experience, I should tell you what the Gala was all about. Not only was this a fabulous way to enjoy the Oscars, but it was for a great cause supporting a Milwaukee organization called COA. "COA Youth & Family Centers helps Milwaukee children, teens, and families reach their greatest potential through a continuum of educational, recreational, and social work programs offered through its urban community centers and rural camp facility." (taken from the org website http://www.coa-yfc.org) All of the proceeds from the event went to this organization - it really was a great cause. Not knowing much more than what the event was sponsoring, we weren't quite sure what to expect. We arrived at the Hilton Milwaukee City Center, made our way to the 4th floor, got our tickets, and made our way up the grand staircase after being stopped for a photo op. Reaching the top of the stairs, I couldn't help feeling a bit giddy, feeling like a star. There before me was the red carpet, lined with students from the COA program asking "who are you wearing?" "who is your vote for Best Picture?" Cameras flashed as we made our way down the red carpet, only to be greeted with a glass of champagne upon reaching the end. This was more than I had expected, I was ecstatic! After getting our photo taken at the YHTS photo booth (see image above), we made our way into the silent auction room where we were wowed with the extravagant prizes to be won. Making bids on several items, chatting with some of my husband's co-workers and friends, the time then came to be seated in the beautiful ballroom. I continued to be amazed by the event as on our seats we found official Oscar program books. Because this organization has been putting on this telecast for so long, it became the only Wisconsin Oscar party officially sanctioned by the Academy of Motion Picture Arts & Sciences- meaning we were able to receive such things as these fabulous programs- the ones that the stars receive!!! (see image above) Wine, a delicious white balsamic salad, a petite filet mignon with garlic mashed potatoes, tinker bell peppers and asparagus, and a decadent chocolate dessert made the dinner a definite highlight of the evening. 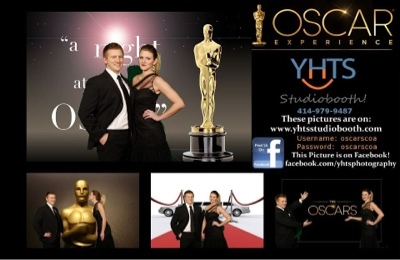 Finally the time had come for the Oscars to begin and we watched the Academy Awards via telecast. Mark Baden from WISN 12 acted as MC and filled in the spaces where the commercials would take place with different contests, live auction items, and presentations about the COA organization. I thoroughly enjoyed the awards- didn't Seth Macfarlane do a great job? One of my favorite Oscar moments, was definitely the performance by the cast of Les Miserables. Let's be honest, it gave me goosebumps. As the Oscars came to a close, we collected our silent auction items (a 4-pack of Bucks tickets and VIP courtside club passes, and 2 classes at a Fred Astaire dance studio - so excited!! ), and made our way out of the grand ballroom. Making our way again down the red carpet on our way out, I couldn't help but smile thinking about the fabulous evening we had just experienced. Go ahead and call me crazy for being so excited about the fun night at the Oscars- but I love love love fun, random experiences like this. (A special thanks to my husband's boss who gave us this opportunity!) I always dreamed of attending a red-carpet event! And although this wasn't the red carpet of course, it was still in one way or another, a dream come true. So cheers to dreaming big, and taking special opportunities to enjoy moments you never thought you could!